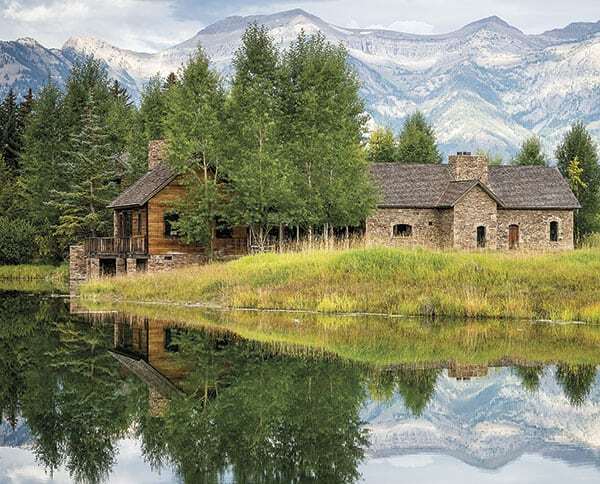 A masterful example of masonry built by the hutterites in eastern montana during the late 1800s is moved, stone by stone, and resurrected in Jackson, Wyoming. 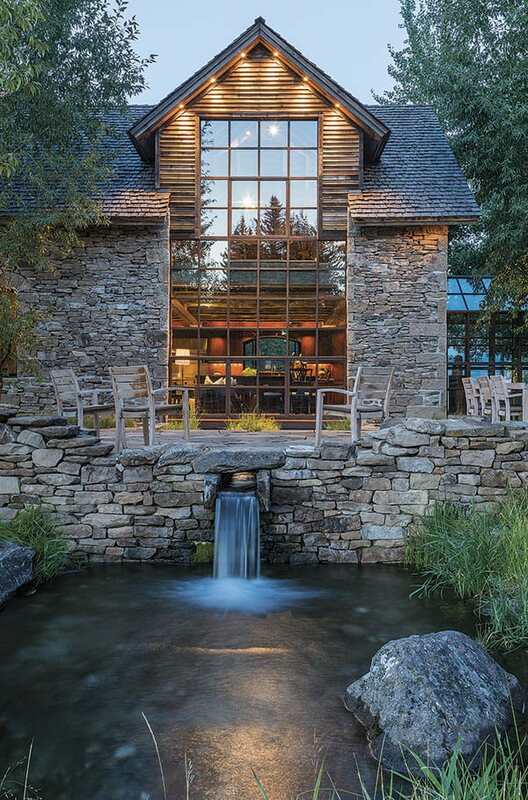 A stone collector for John Mills of Select Stone, the rock supplier for the architectural firm of JLF & Associates, was out in eastern Montana scavenging among the scree—piles of stone on the slope or base of a mountain that have fallen in a rock slide—when he spotted an old building. The roof was caved in, but the structure’s weathered stone walls were beautifully intact—and gracefully arranged. He alerted Mills, who brought JLF President Paul Bertelli to the site. Bertelli envisioned a world of possibility for the old ruin and showed it to a client for whom the firm had done several projects. Thoroughly enchanted, she decided to purchase it on the spot. The ruin’s ancient stones, if they could speak, might spin a tale of the early masons who gathered them and set them lovingly in place. The story actually begins in the early 1670s, when Queen Catherine the Great of Russia encouraged western Europeans to settle in Russia, with grand promises of land along with political and religious freedom. Many German Hutterites, a communal religious group with similarities to the Amish and the Mennonites, took her word to be good and made the journey from Germany. An ancient, natural aquifer not far underground was carefully utilized to create the water features that grace the Creamery. The glass and steel walkway that connects the original Creamery to the adjoining additions unobtrusively blends old with new. The stones used in the walkway floor were reclaimed from castles and estates in Yorkshire, England. One hundred years later, political turmoil and oppression sent those same settlers fleeing to North America. Sites of immigration included British Columbia, Alberta, and the northern US, including the Dakotas and the eastern plains of Montana near Great Falls, where the stone building’s first incarnation as a Hutterite dairy and milking station came into being somewhere in the 1860s-1880s. Kitchen cabinets were detailed to relate to the showpiece kitchen island, which is constructed of white oak and designed to resemble 16th century breakfront cabinetry. Floors are 15’ wide fir plank. Fast-forward another hundred and fifty years or so, as the newly rediscovered dairy inspires a brainstorming session among its new owner and the lead designers at JLF. Soon, a plan was conceived, albeit ambitious. The structure, now dubbed the Creamery, would be disassembled, moved to Jackson, Wyoming, and then reassembled on site. As the complex task got underway, every stone was labeled, numbered, photographed and noted in a drawing. 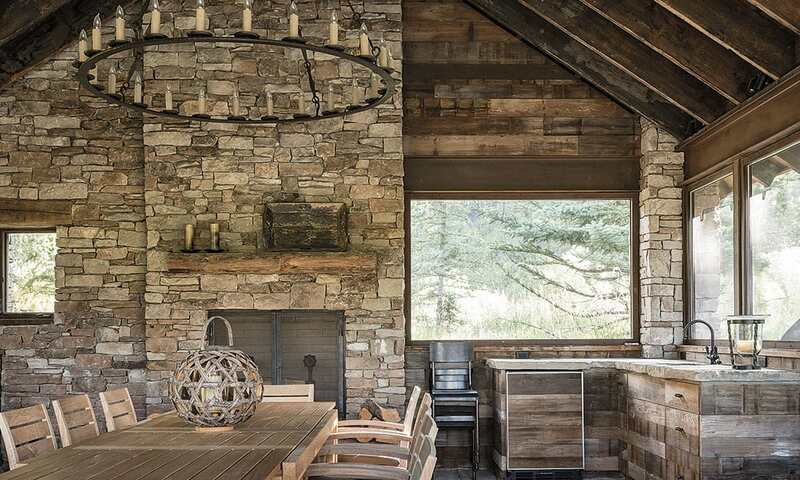 With stonework, the most critical components are the hand-cut pieces for the headers and edges of windows and other openings, which were carefully coined in the original masonry. Coined, in this usage, originates from the old French word quoin meaning corner or angle. Large and small stones are strategically placed to visually define, enhance and accentuate a structure’s geometry, a technique used in classical Rome and more recently in 17th century France and England—as well as in the United States in the 1800s. In The Creamery’s case, all stones near or on an opening or corner piece, would be put back in their original places, hand chiseled and shaped once again by craftsmen, and then coined as in the original structure. To ensure it all reassembled as expected, every “field” of stone of the original Creamery walls—both external and internal—was palletized separately and labeled north, south, east, or west. The bigger, flatter stones used for footing were also noted as such. “Not a stone was left unturned” was never more apropos. 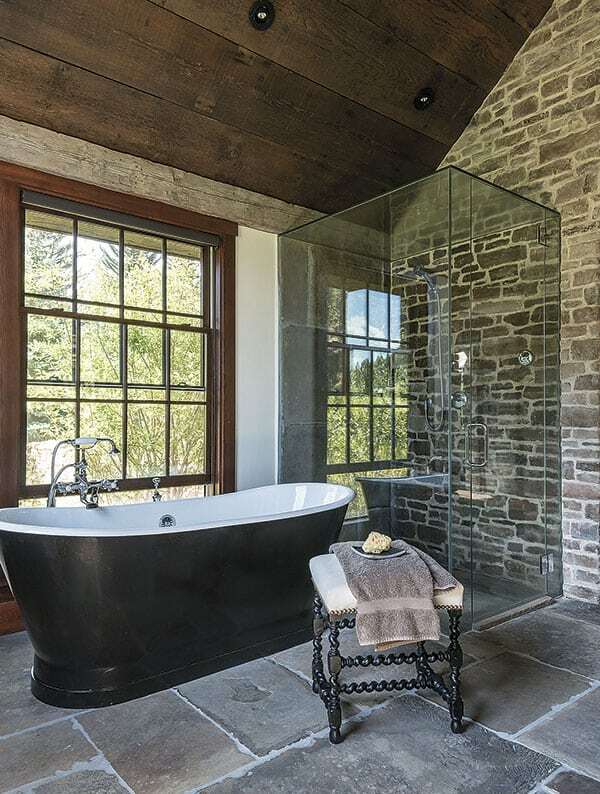 The master bath is both rustic and modern. its flooring—as is the home’s glass and steel walkway—was salvaged from castles and estates in Yorkshire, England. JLF Design Build, the collaborative team of JLF & Associates and builder Big D Signature, had more than the formidable stonework ahead of them with which to contend. 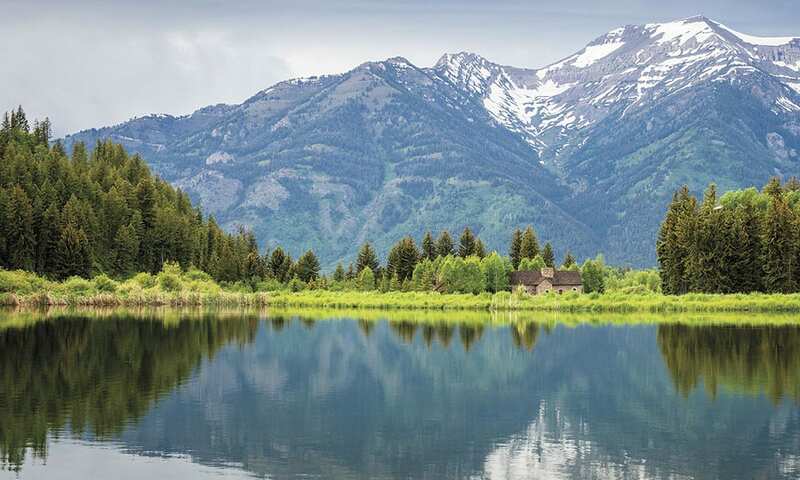 Jackson, Wyoming, is on an alluvial plain with deposits of river cobblestones where the Snake River undulated across the land over time. The site chosen for the construction and relocation is on wetlands, near trout spawning waters and the confluence of the Snake River and its tributary, the Gros Ventre. In the master bedroom, (part of the newer addition) The variegated colors of the stone wall and timbered ceiling are echoed in the room’s appointments. Crisp linens on a sleek mohair-upholstered bed by Cisco add a contemporary contrast to an old-world, turned leg tapestry bench. A bold coral and black throw contributes an exuberant jolt of color. The land is porous and the ground water high. The headwaters of the Snake River—and most of Yellowstone—along with the Gros Ventre Range and the Tetons to the west all drain into this watershed, creating an aquifer of rapidly moving water running roughly 3-15 feet below the surface of the ground. As a result, the new Creamery was rebuilt six feet above the surface. Its ancillary structures, such as the boathouse pavilion, were transitioned down to the level of the existing wetlands. Great care was taken to minimize trauma on the delicate ecosystem, as the land is a significant sanctuary for wildlife. From the 35-acre total parcel, a one-acre building envelope was selected on pasture grassland. Though the forest seems almost at arms length, the location ensured the new home would not be screened in by trees or visually impeded. The Creamery would stand once more among native prairie grasses weaving in the breeze. The interior of the boathouse is a continuation of the tranquil hues and stone work that are a hallmark of the original Creamery. With regard to the Creamery itself, the team did not change the original openings, which were rebuilt as they had once stood long ago. The massing—an architectural term for the height, length, pitch and perfect proportions—was not altered. 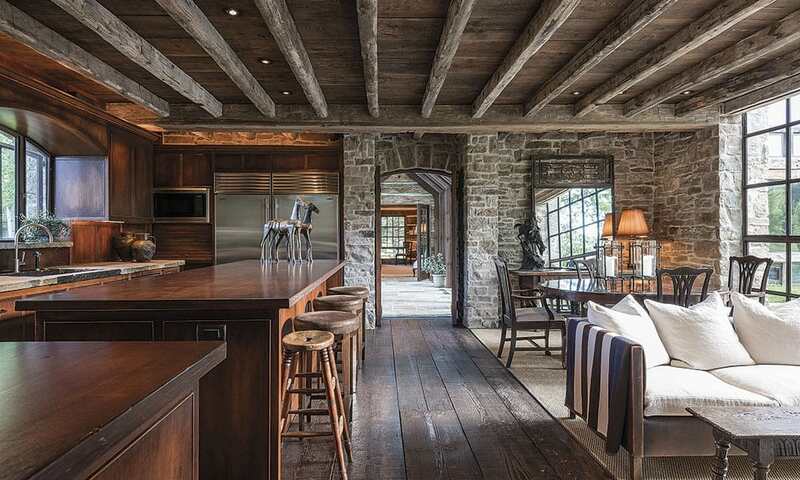 In what was the original Creamery, a kitchen, pantry, living room, dining area and powder room exist, as well as an original loft that once stored hay. A clear hallway of steel and glass links the restored Creamery with newer areas that house such as the master bedroom and other sleeping quarters. The property includes a separate guesthouse as well as an outdoor boathouse. The stones comprising the newer areas are Homestead Stone, sourced from the same region of the Creamery’s earlier locale. The boathouse pond is fed by an ancient-looking, but newly created, stone spillway. 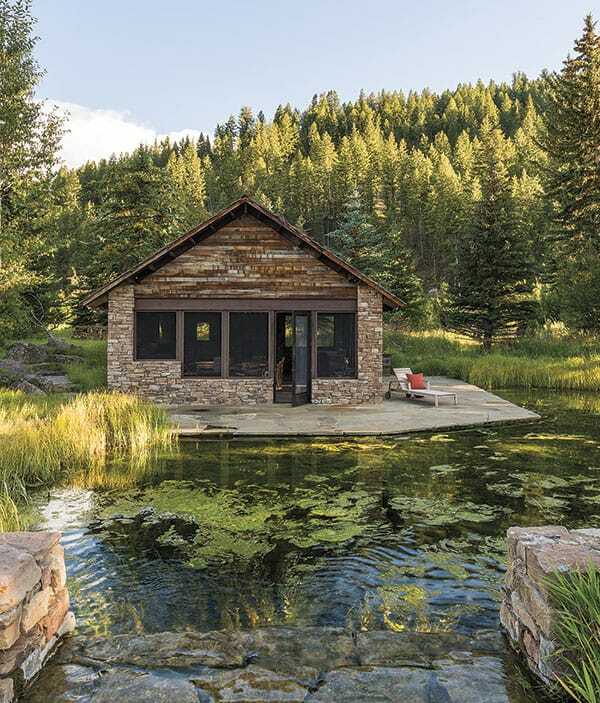 The success of the Creamery’s restoration—and a reputation for the seamless blending of old structures with new—can be attributed to the long and collaborative relationships JLF Design Build has developed over the years, including with Landscape Architect Jim Verdone. Perhaps Jason Dunlop, Vice President of Big D Signature, sums it up best when referring to “parkitecture,” a term also used by lead designers Paul Bertelli and Logan Leachman, which exemplifies the team’s approach: building a new structure with the patina and presence of something that might have been found in our national parks 100 or more years ago. Wherever the Hutterites are that first built the Creamery, they are surely smiling.